$5,000Thank you for not asking me to Chair an event! $2,500Awesome! I love not adding another event to our calendar. $1,000I appreciate the opportunity to just hang out with my family watching the big games on TV. $500My spirit is lifted, I’m happy to support quality education. Please consider RSVP'ing today and join fellow Guardians Club members** supporting SMA’s mission during our time of growth. Clubs are forming in Petoskey, Harbor Springs, Walloon, Charlevoix other locations. Share a note in "comments" if you would like to join a specific club or become an Ambassador for another location. **Guardians Club members commit to an annual recurring pledge, at a level of their choice, for five years. Every dollar goes directly to funding teachers, students, and school operations. Please make your online, five-year annual membership gift to the right or, if you prefer to pay by check or make a pledge/payment by US Mail, please click here to print a PDF donation form. REMEMBER - Anonymous Guardians have generously pledged to double new members’ first-year gifts...up to $150,000! But we must act fast - new gifts or pledges must be secured by 12/31/18. And... they will match every dollar OVER $150,000, up to $300,000, also generated from first-year memberships - BUT we must first meet the end-of-year deadline! *The 'sNO BALL is a non-event event. There is no party to attend, no dress to buy, no evening to give up. This also means there is no money being spent on a venue, food, decorations, or entertainment, allowing 100% of the proceeds raised/pledged to go directly to support St. Michael Academy’s mission - to prepare students for life through the development of the whole person according to high standards of moral and intellectual excellence, and to develop students’ ability to lead with a world-view rooted in Catholic values. Please consider RSVP’ing today and join fellow members supporting SMA’s mission during our time of growth. 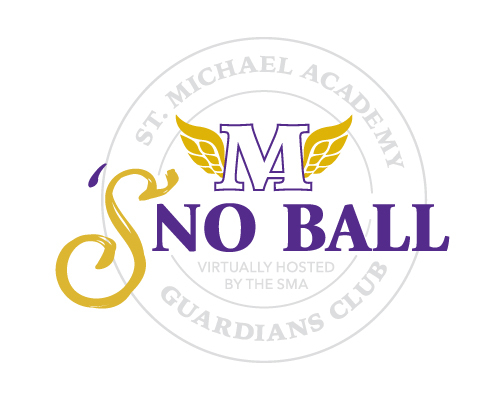 St. Michael the Archangel Foundation is a 501C3 non-profit organization that supports St. Michael Academy. The Foundation's tax-deductible EIN# is 47-3507842. No goods or services were received in exchange for this donation.